Absence doesn't make the heart grow fonder. It makes people think you're dead. So begins Christopher Fowler's foray into the back catalogues and backstories of 99 authors who, once hugely popular, have all but disappeared from our shelves. Whether male or female, domestic or international, flash-in-the-pan or prolific, mega-seller or prize-winner - no author, it seems, can ever be fully immune from the fate of being forgotten. And Fowler, as well as remembering their careers, lifts the lid on their lives, and why they often stopped writing or disappeared from the public eye. These 99 journeys are punctuated by 12 short essays about faded once-favourites: including the now-vanished novels Walt Disney brought to the screen, the contemporary rivals of Sherlock Holmes and Agatha Christie who did not stand the test of time, and the women who introduced us to psychological suspense many decades before it conquered the world. This is a book about books and their authors. It is for book lovers, and is written by one who could not be a more enthusiastic, enlightening and entertaining guide. A real gem, filled with old favourites and new discoveries, and written in a light, snappy, erudite tone, as satisfying as a full English breakfast at your local art-house cafe. This is a book of treasures, with so many authors supposedly forgotten, and so the thrill and delight in reading this book is manifold. The first for the reader to see if he has read any of the authors discussed in this book. One of those whose books I had read is Dino Buzzatti (whose ‘The Tartar Steppe’ is the unforgettable novel I read). Given the lead by Fowler, I rushed to the bookstore and to my surprise, found a copy of the collection of Buzzati’s short stories that included ‘Seven Floors’ mentioned by Fowler. It is simply amazing that many of the books have long been out-of-print and forgotten yet they live on because the films that were made from those books are still watched. ‘The Manchurian Candidate’ by Richard Condon was not only made into a film in 1962, starring Frank Sinatra and Janet Leigh, the film was remade in 2004 starring Denzel Washington and Meryl Streep. Richard Condon also wrote Prizzi’s Honour, the first of four parts was also made into a film. Condon is now, sadly, forgotten. If one remembers the film, ‘The Fly’ he might be forgiven for not knowing that it was based on a book by George Langelaan. Interspersed in various parts of the book are personal essays that include books that had been made into films by Walt Disney. Out of 80 films Disney made in a span of twenty years, only 19 were not adapted from books. His essays include one on the forgotten books of a familiar and not forgotten author – Charles Dickens. Fowler wonders why ‘A Christmas Carol’ is so loved when, in Fowler’s opinion, Dickens’ ‘A Christmas Tree’ is hardly ever mentioned. The essay entitled, ‘The Forgotten Rivals of Holmes, Bond, and Miss Marple’ regales us with a long list of worthy alternatives to Sherlock Holmes, James Bond, and Miss Marple’. Patricia Wentworth created ‘Maud Silver’, and August Derleth created ‘Solar Pons’ when Conan Doyle declined to let Derleth take over the Holmes series when he (Doyle) retired. Ironically, after Derleth died, Basil Copper (another forgotten author) continued the Solar Pons series by writing about Pon’s ‘missing cases’. 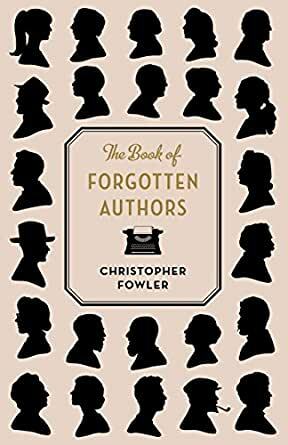 ‘The Forgotten Booker Authors’ is the essay with lovely vignettes of forgotten authors in the unforgettable context of the Booker Prize winners (and near-winners). Considering that 2019 will be the 50th anniversary of the Booker Prize, one might pay attention to this essay by Fowler to see how the judges might pick from next year’s short list. Stanley Middleton, a watercolour artist won the prize in 1974 for his book, ‘The Holiday’, he was only able to find one publisher, whereas initially, no one wanted to publish V S Naipul’s ‘In a Free State’ (winner in 1971). We should also remember that Beryl Bainbridge (famous for her historical novels) lost twice, and Ali Smith, three times. Fowler presented 99 authors individually, beginning with Margery Allingham, and ending with Cornell Woolrich. Never heard of him? His books were made into films by Alfred Hitchcock (‘It had to be Murder’) and Francois Trauffaut (‘The Bride Wore Black’, ‘The Phantom Lady’, and ‘Night Has a Thousand Eyes’). In case you’re wondering, why are good authors forgotten? That question is posed and answered by Fowler in his introductory essay with that question as its title. She enjoyed reading about authors she didn't even know existed. Great spring board. Brilliant. And a great help for scouting purposes. Very interesting book. Gave me ideas of books to try to track down.